The truck driver pulled over to the kerb. Lancaster climbed out of the truck into a raging storm. The wind whipped along the desolate stretch of road, driving cold rain into her face. The ancient truck heaved itself away, its blinking rear lights soon swallowed up by darkness. She turned and looked at the decrepit bus shelter, its sole light still shining like a safety beacon behind broken glass. The only bright spot in either direction for at least a mile. I’m surprised the electricity is still on out here. Lancaster pulled up her hood and forced her way forward into the rain. 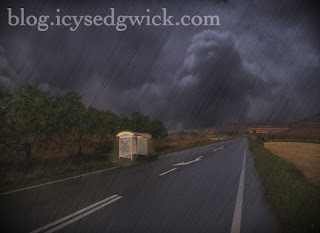 A fork of lightning tore open the sky, its white flare illuminating a large advertising hoarding across the road. It announced the arrival of a new housing estate, a supposed oasis of executive homes and manicured lawns on the edge of town. Flag poles lined the road into the estate, and gusts of wind snatched at the flags. The canvas snapped and whined. Lancaster ran across the road toward the estate. The expanse of empty buildings unfurled before her as she hurried along the entry lane and down the slope. The edge of town development now lay on the edge of the exclusion zone – after the Outbreak, no one much cared about executive homes. Palatial as the properties were, they were too far away from the safety of civilisation – or what now passed for it. Lancaster cursed the weather, the water already soaking through the canvas of her shoes. She squelched along the main street, heading for a cluster of homes squatting in a cul-de-sac near the edge of the estate. A figure crouched beneath a makeshift lean-to at the top of the nearest driveway. Water flowed down the back of the tarpaulin, and the glow of a homemade cigarette burned within its shadows. “Password?” The voice within the lean-to was gruff but not unfriendly. The figure stretched a hand out of the shadows and waved her past. Lancaster nodded and hurried down the driveway towards the house. Its empty windows regarded the street with a mixture of apathy and boredom. A man stood up from his position in the shadows beside the front door. His parka hood was drawn up, and a scarf hid the lower portion of his face. Lancaster fought the urge to roll her eyes – they took things too seriously out here. She wanted to shake them, to tell them that few would risk leaving the city, and that the rumours of gangs roaming the virus lands were just rumours, but she knew they wouldn’t listen. I reckon they’re enjoying getting to play at being soldiers. “You’re Lancaster Black, ain’t you?” The scarf muffled his words. She growled. She agreed the name was stupid – she hated that her parents named her for the town of her conception, but now she’d never actually visit, she’d almost grown attached to her peculiar monicker. The rude guard waved her through and she made her way inside. She always shivered inside No. 43. The unfinished house seemed to echo with the unrealised plans of the architects. Her eyes followed the curve of the staircase, where more hooded people lurked on the landing. Lancaster ignored them and walked through the house to the kitchen. The kitchen was a hive of activity, as people in camouflage clothing bustled around with foolscap folders and maps. A woman sat at the kitchen table, marking locations on a tattered road map with a wax crayon. Wavy brown hair hung over one shoulder. “Lancaster! You made it!” The woman looked up, a smile spreading across her lined face. Lancaster stared. My mother had that same smile. Lancaster reached into her bag and pulled out a set of keys. Everyone in the kitchen stopped to stare as she dropped them onto the table with a clatter. “You actually got them?” The woman stared at them. “I just wanted to help.” The way you never helped my mother. Lancaster turned and left the kitchen. Auntie Em called after her but Lancaster ignored her. She’d done what was asked of her, and now it was time to sever her last family tie. If Auntie Em and her new family wanted to ransack the First Minister’s home as a protest about the lack of interventions in the virus lands, then that was their business. Thoughts of her mother, dying alone in an isolation ward while Auntie Em’s cronies stifled the supply chain of the vaccine that could have saved her, occupied Lancaster all the way back to the bus stop. She looked up at its flickering light through a haze of tears and hard rain. Lancaster glanced at her watch – still another three hours before curfew, and it was only an hour and a half walk to the city. She stepped under the protection of the bus shelter and pushed back her sodden hood. She sat on the hard plastic bench, angled to prevent the homeless sleeping on it, and closed her eyes. The pattering of rain on the roof made her sleepy. I’ll just wait here for a bit. Maybe the rain will ease off. She thought of her mother, buried in a mass grave. Or maybe I’ll wait here forever. Now that I have published two Western books, The Wanted Man and Outlaw, I am discovering something that I realized a few years ago when I started looking for markets to submit my short stories. Back then, there really weren't many places that published Western fiction. Likewise, there are not a lot of places to market a Western novel today. There are a couple of book listing sites but those places don't promote your work for you. Writers who work in the Western genre are faced with the task of not only finding marketing opportunities for their fiction, but fighting against what seems to be a stigma against Westerns. Sometimes in talking to new people, it always shocks me that they seem interested in my work until they find out I write Westerns. Some have bluntly told me they don't like them or don't read them and it always leaves me wondering why. Have they actually read one or are they judging them by assumption? People could be jumping to conclusions about modern Western writing. Perhaps they think of the genre as outdated. Yet nothing could be further from the truth. Early classic Westerns are tales of black and white, of moral absolutes of right and wrong, and there is nothing wrong with those kinds of stories. However, a lot of today's Westerns explore the gray area. I think the turning point in the genre came with Clint Eastwood's film, Unforgiven. That movie is my biggest inspiration, and I think it completely reinvented the Western. Take for example the success of the AMC series, Hell on Wheels. It is by no means a classic Western. The main character is an antihero and is a far cry from the normal Western protagonist. The characters in Hell on Wheels are not perfect, they are flawed human beings who people can identify with and I think that is the key to the success of the show. For me, the beauty of the genre is that any kind of story can be told as a Western. It is an unlimited tapestry and the potential is endless. There are a myriad of subgenres ranging from Western Historical Romance to the Weird Western and everything in between from Horror to Mystery. Anyone who likes to read can find a Western they will enjoy. I think that the key to marketing Westerns in the future is to keep fighting against the stigma. Write stories that breathe fresh air into the genre instead of using the same old clichés, and most of all, never apologize for writing Westerns. 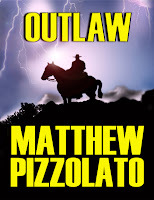 Outlaw is available from Amazon US and Amazon UK. 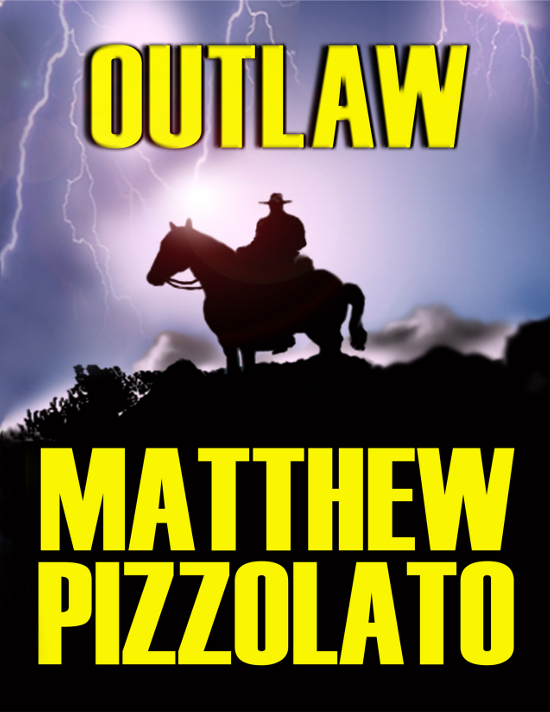 The outlaw Wesley Quaid wants to put the past behind him and start his life anew in another place where no one has ever heard of him. When a mysterious woman he once knew resurfaces, Wesley discovers that a man can't run from his past anymore than he can run from the kind of man he has become.